Creator of world’s first purpose-built, 24-hour guest room assistant debuts interactive website to educate the market on Angie’s unique benefits to both hotel properties and guests. 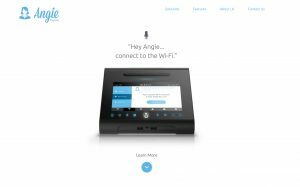 San Jose, CA – June 27, 2017 – Angie Hospitality, creator of Angie, the world’s first interactive 24-hour guest room assistant, Wi-Fi and room control technology solution, today announces the official launch of its newly-developed corporate website, designed to bring Angie’s full suite of capabilities to the forefront of the hotel industry. The first phase of this highly informative and interactive website offers key decision makers detailed information on Angie’s wide range of capabilities and benefits to hotel guests, as well as the value she can bring to hotel operations and revenue. The second phase of the site will also provide integration with angie.services, Angie Hospitality’s password-protected online customer portal, in order to provide Angie’s hotel partners with convenient access to personalized information and services. Angie responds to a variety of guest requests using her advanced, multilingual voice and high-resolution touch screen interfaces. Guests have the option of making requests through Angie via simple voice commands, or they may choose to use her interactive touch screen as an alternate method of requesting hotel services or amenities, such as instantly connecting multiple guest devices to Wi-Fi, setting alarms, playing music, making phone calls, and confirming or taking reservations. In addition to maximizing the hotel stay experience for guests, Angie also offers a plethora of operational efficiencies to hotel management and staff. With her ability to recognize unoccupied rooms through the use of occupancy-sensing technology, Angie can be alerted to adjust temperature or lighting to help lower utility costs and help meet sustainability and efficiency goals. Her digital display screen can also be used to promote on-site amenities, such as sending and alerting guests of promotions for restaurants, spas and retail outlets to further increase hotel revenue opportunities. Hotels can also offer event organizers a way to engage and communicate with conference and meeting attendees, using a new interactive in-room medium. For more information on Angie and her full suite of capabilities, please visit www.angie.ai. About Angie Hospitality | Angie Hospitality, led by industry veterans, designs and develops the only 24-hour interactive guest room assistant, Wi-Fi and room control technology solution built just for hotels and resorts. The 2017 HTNG TechOvation Winner, Angie is the world’s first enterprise-class, cloud-managed platform built on a secure, scalable, and highly-available architecture that is continuously monitored and enables her to self-configure for each property and room as soon as she’s plugged in. With headquarters in Silicon Valley and London, Angie Hospitality currently offers services in North America and Europe, expanding soon to Asia Pacific and the Middle East. For more information on Angie Hospitality, please visit www.angie.ai, and connect with us on our social media channels – Facebook, Instagram, Twitter and YouTube.